The concept of Artificial Intelligence seems to lend itself exclusively to Hollywood big budget movies or to tech giants like Google and Apple. Yet considering how and what value could be gained for the travel industry to adopt any form of AI seems like an impossibility. Because of disparate systems, siloed data storage and business confidentiality, just to name a few. The travel industry is just barely sinking baby teeth into Machine Learning, so how does Artificial Intelligence creep into the mix? It should go the Hollywood route and turn to video to give it a run. The wave of video in the travel industry is less than a decade old, yet shortly after its marketing impact was starting to be understood, the social media sites took the spotlight. It almost didn’t stand a chance to impact destination and supplier marketing as it was shoved in a virtual corner on brand websites and thrown at YouTube with the hope of a viral pick-up. Industries such as bookstores, shoe, companies, and clothing retailers stayed the course and started integrating rich media into all of their marketing materials, and the travel industry diverted to tweets, hashtags, and Instagram. Video played a very second fiddle to that loud space, but with the introduction of Artificial Intelligence, its quite possible that this form of rich media will have its comeback tour. The common use of video in all retail purchases shows that consumers are demanding more videos, more images, more relevancy and better content. Just search for a few items on Amazon to see that a video is included with most items – and in many reviews. The consumer adoption is there and online marketers are scrambling to find ways to efficiently and effectively put their media to work. If you do any digging into how Artificial Intelligence is being applied in the video space, you will find a great deal of information about how computers can dynamically edit videos to cut hours off edit time. Very helpful, but not very effective in driving business. A great example of AI already in use in the travel industry would be with site support – online travel agencies, for example, are very familiar with using conversational AI to run chatbots and virtual assistants. All great services, but the most valuable kind of AI is the one that can help effectively bring your company business. In the travel industry, a marketing advantage occurs when consumer interest and engagement is captured through advanced learning and targeting. In short, if the user can find relevant media, they’re more likely to purchase. This is where the intersection of video marketing and AI bring nirvana to a marketing team. Marketing video content allows brands to speak with agility, voice, and engagement, but without proper meta-tagging, they are less likely to be found than their text-based marketing counterparts (articles and tweets). Enter AI “computer vision”, otherwise known as image and facial recognition. With computer vision, an AI engine can “watch” your video to identify every object (woman, bike, wedding dress), activities (party, wedding), and even emotion (smiling, happy). Adding these rich tags to the metadata of the video allows it to be found in context of a user’s targeted search. These updates boost search results in applications and organic search, increasing the odds that it is found when, how, and where a customer is searching. While any individual might tag a video, an AI engine can will catch exhaustive detail and repeat themes. With the emergence of generally available AIalgorithms, travel suppliers can benefit from new capabilities to extend the reach of their rich content. Travel marketers need to clearly understand where the marketing advantages are when it comes to AI. For video specifically, the greatest value is in organic search and time savings. Our experience has shown that while marketing teams tend to understand that video is good thing and that consumers certainly like it, it is certainly not an easy thing to successfully manage or promote without some insight. When a video is added to a web page without a proper description or tags, on an owned site or even on YouTube, the odds of it being found through organic search decrease exponentially. The best solution to ensure that content is found and prioritized appropriately in search results is by AI. 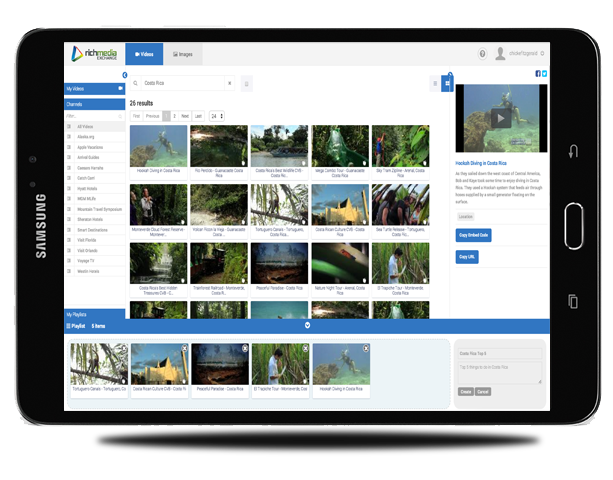 Through simple parameter establishment by a marketing team, combined with image recognition, video can be tagged for specific destinations, locations, travel types, traveler types, and so on. Properly tagged videos that are shared in a video player capable of utilizing the rich tags can becomemarketing gold. In 2018, the Rich Media Exchange is adding an Artificial Intelligence engine to its content management and marketing portal as a benefit to its hotel and destination partners. When a customer uploads owned content, the system will automatically preview the video, add relevant tags, and then prompt the user for approval. From that point, each time the video is shared on the RME platform in social media or on a website, it will be findable by the brand title, description, and by every auto-generated tag. Compared with the time-consuming task of manually reviewing and tagging content, AI can save a brand significant time and expense while yielding far more comprehensive results – and it happens in seconds. The real value comes in the video’s effectiveness. Video has repeatedly proven to increase site visits, revisits, engagement, and shares. If this kind of technology is combined with the right offer, links, and supplier information, the opportunity to drive initial traffic will only increase business over time. CCRA Announces Strategic Partnership with Rich Media Exchange Providing Digital... Do Travel Advertisers Know What Color Underwear You Are Wearing?